Dr. Runkle is a board-certified foot surgeon with a special interest in diabetic foot care and sports medicine who treats all foot and ankle conditions. Our Experienced Foot and Ankle Surgeon Brings Relief to Those Suffering from Simple to Complex Conditions. Painful foot and ankle problems can affect anyone from hardworking moms to high-level athletes and everyone in between. In his nearly 20 years at Center Grove Foot & Ankle Care in Indianapolis, Dr. Runkle has seen—and treated—it all. As a former runner and triathlete himself, he has personally experienced many of the foot and ankle issues his patients are suffering from and is committed to treating the problem and helping patients prevent a recurrence. Dr. Runkle treats the patient, not just the condition, and his goal is your goal—a pain-free return to the activities you love. Heel pain. We offer a variety of treatment options for heel pain caused by plantar fasciitis, from custom foot orthotics to referrals for physical therapy. Skin and nail problems. Ingrown toenails and plantar warts are more than just an annoyance; they can be painful and unsightly problems that keep you off your feet. We can treat these conditions with simple, in-office procedures. Bunions and hammertoes. We take a conservative approach to these common yet painful conditions, but if surgery is required, Dr. Runkle has the training and experience for a successful procedure. Diabetic foot care and complications. With extensive training in comprehensive diabetic wound management, Dr. Runkle takes a proactive approach to diabetic ulcers. Sports injuries. Athletes are hard on their feet, and even a minor foot injury can sideline them. Don’t wait to get the diagnosis and treatment you need to get back out on the field, court, or track. If you have been suffering from heel, foot, or ankle pain, don’t hesitate to make an appointment at our office and get a diagnosis. The longer you wait, the harder it can become to treat the problem. A call to our office staff today is a step in the right direction. 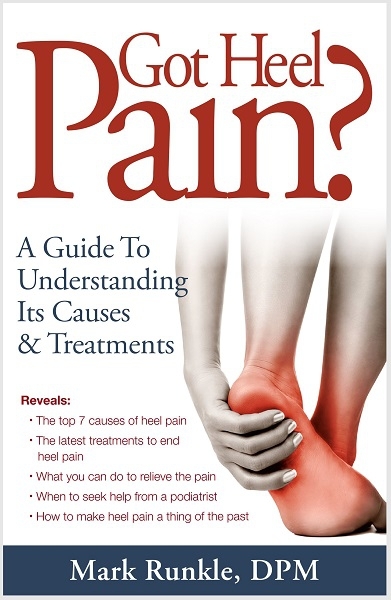 Interested in receiving a copy of our free heel pain book? Provide your name and email address and we'll send it to you immediately. Commitment to the community. Dr. Runkle has practiced podiatry in southeast Indianapolis for over 20 years. He is connected to a network of doctors, physical therapists, and retailers to approach your treatment from every angle. Conservative approach. Never jumping straight to the most extreme treatment, Dr. Runkle starts patients with the least-invasive and lowest-cost options first and only recommends surgery as a last resort. Innovative treatment. We offer the latest in treatment methods and technology, including platelet-rich plasma (PRP) treatment to heal damaged tissue and shock wave therapy for plantar fasciitis and tendonitis. Unmatched training and experience. Highly skilled in many surgical procedures and affiliated with several area hospitals, Dr. Runkle is the only doctor you will need to treat your foot or ankle condition. If you have been suffering from a painful bunion or ingrown toenail or a family member has had to cut back on exercise because of tendonitis or arthritis, get the help you need from a trusted Indianapolis podiatrist. Same-day appointments are available for emergencies, and we offer a variety of payment plans for your convenience.